The game ended before the Bears even tried to score. With less than half a minute left in the match, Cal failed to capitalize on its final possession to bring its game against Oregon into overtime on Sunday. The Cal lacrosse team’s lack of discipline and intensity ultimately led to its 10-9 loss to the Ducks in Eugene, Ore. 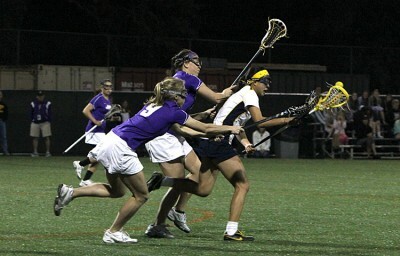 Although Cal (1-2, 1-1 in MPSF) lost 13-9 to No. 9 James Madison on Thursday, the Bears were more disappointed in their loss against the Ducks in their second MPSF conference match Sunday afternoon. Cal made four goals — all by different players — in the first half of the game. Among those who scored were junior midfielder Megan Takacs, who was named to the All-MPSF first team last year, and freshman midfielder Gaby Christman, who scored the first goal of her college career to tie the game at 2-2. Junior midfielder Melissa Humphrey converted an eight-meter goal halfway through the first period, and senior midfielder Emily Abbood made the last goal of the period; howev0er, the Bears still trailed 6-4 at halftime. In the second half, Cal outscored the Ducks 4-2 to tie the game at 8-8. But Oregon scored twice more, causing the Bears to trail by two points. Takacs notched her fifth goal minutes before the game ended to take the score to 10-9. However, neither team recorded a shot for the remainder of the match, giving the Ducks the victory. In the last few minutes of the match, the Bears played a possession game against Oregon and finally ended up with the ball with 25 seconds left. However, they could not score a goal to make the game run into overtime. The Bears hope to use this loss as an opportunity to learn from their mistakes. Cal will have a break for the next week and a half to improve before its next game against Detroit on March 8 in San Diego.